Start early. Try to clear snow early and often. 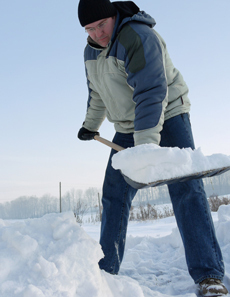 Begin shoveling/snow blowing when a light covering of snow is on the ground to avoid dealing with packed, heavy snow. Clear vision. Be sure you can see what you are shoveling/snow blowing. Do not let a hat or scarf block your vision. Watch for ice patches and uneven surfaces. The above is an excerpt from the article, “Prevent Snow Shoveling and Snow Blowing Injuries.” For more information, please visit www.orthoinfo.aaos.org.